I’m going to start this week on some good news with the Stags’ youth team beating Dereham Town in the FA Youth Cup, and now going on to play the Premiership youngsters of Sunderland in the next round. Well done to the youth team, and to do it with 10 men was even better. After such optimism before the game against Northampton it ended in a disappointing weekend after we lost the game 1-0. To be honest we had a lot of decent play with the ball in spells. But once again, just like the story in the last four games, we haven’t scored a goal, and if you don’t do that obviously you’re not going to win. The bad thing about it as well is if we were confident in front of goal we could have easily won this game. In my opinion I think it’s now the time to bring in a loan striker or two, maybe just to freshen it up and maybe help Greeny. 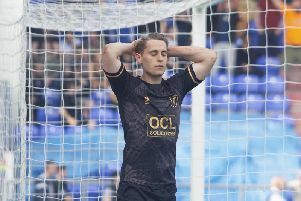 I don’t think there was a man of the match for us yesterday, and as the game went on you could see we got hugely frustrated that we didn’t put it in the net. But you can’t fault the lads for their effort. As said above it showed near the end of the game when Ryan Tafazolli went up front. By this time they dealt with our threat and dealt with it easily towards the end of the game. Even though he is a former Spireite, I’m going to say I was quite impressed with Northampton’s goalscorer Marc Richards, who played the lone striker role perfectly. That’s about all I’m going to praise though as he doesn’t deserve any more! To summarise, I was once again disappointed to lose when we had more than enough chances during the game. I just don’t know what’s going on in front of goal. I see teams getting bits of luck deflecting the ball in or other teams gifting you goals, but it’s just not happening for us. After watching Hartlepool today and the luck they got in front of goal, why can’t we have that luck? Leyton Orient were by far the better team, but the luck was on Hartlepool’s side and they got a undeserving win. It is by no means the end of the world and we are still sixth in the league, but all the teams around us are getting really close now, so we need a win next weekend, that is for sure. Before then, though, we have another really tough game against Oldham on Tuesday in the FA Cup replay. It could be a game to try new things and go for the win as we have absolutely nothing to lose. I would like to finish this week with something a little bit different by congratulating Oldham for beating the Spireites - that did make my day after our loss. So come on Adam Murray’s barmy army and COYS. I’ll also mention about the disaster in Paris on Friday night - our thoughts and support go out to everybody involved.